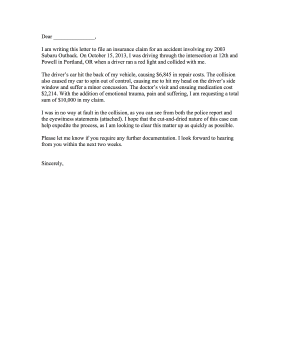 File for an insurance claim with this printable vehicle accident complaint letter. I am writing this letter to file an insurance claim for an accident involving my 2003 Subaru Outback. On October 15, 2013, I was driving through the intersection at 12th and Powell in Portland, OR when a driver ran a red light and collided with me. The driver's car hit the back of my vehicle, causing $6,845 in repair costs. The collision also caused my car to spin out of control, causing me to hit my head on the driver's side window and suffer a minor concussion. The doctor's visit and ensuing medication cost $2,214. With the addition of emotional trauma, pain and suffering, I am requesting a total sum of $10,000 in my claim. I was in no way at fault in the collision, as you can see from both the police report and the eyewitness statements (attached). I hope that the cut-and-dried nature of this case can help expedite the process, as I am looking to clear this matter up as quickly as possible. Please let me know if you require any further documentation. I look forward to hearing from you within the next two weeks.